Computer technology touches many parts of our lives from the way we shop and the cars we drive to our interaction with governments. It drives innovation in the sciences, engineering, business, entertainment and education. A degree in computing can offer you excellent job prospects. Whether you like solving problems, are keen to develop and build new systems or want to work in digital media, we help you gain the skills to do it. Here we provide flexibility for you to build a degree based on three main themes: Information Technology, Computer Science and Web Production. You have a range of option modules to select from within each theme, so that you can tailor your learning to match your own specific requirements. You are introduced to algorithms and to algorithmic problem-solving with an emphasis on solving computer programming problems. Recreational problems, like games and puzzles, are used to convey important algorithmic concepts and techniques. An understanding of the basic skills needed in algorithmic design to produce an efficient solution is emphasised. You use problem examples introduced in the Introduction to Programming module. You also gain experience of modern development tools and techniques to develop, test and deploy client-side applications. Assessment is by a single, individual in-course assessment that requires you to collate a portfolio of solutions with appropriate reflection on the solutions and the learning experience. You learn how programming language constructs are applied to different problems of increasing complexity. All programming solutions are executed in a web-browser, however there is focus on developing your core programming knowledge and skills. Working on a web project, you gain practical experience in developing, testing and deploying web products. Adopting an agile project management approach, you develop knowledge and skills in managing a project and documenting it using appropriate tools and techniques. There is an emphasis on the development of professional skills including teamwork and delivering presentations. During the module you also develop employability artefacts such as online profile and professional CV. As the scale of the applications you are developing increases, this module will provide you with the knowledge and tools to control the complexity of your code. The Patterns Model-View-Control pattern is one such solution. You will be introduced to a range of libraries such as jQuery and Angular.JS to improve your productivity and extend your understanding of the Application Programming Interfaces (API). Your programming knowledge will also be extended to include classes and prototyping. You will learn how to develop server side web applications using PHP, focussing on building decoupled web apps driven by an appropriate server side architecture. A briefing document will demonstrate the need to record functional requirements before creating a data model. You will recognise how a Model-View-Controller architectural software pattern can be utilised to bring structure and order to your code. You develop of a web-based solution, taking into consideration appropriate legal issues and professional ethics. The majority of this module is practical and based on a scenario relevant to the web development. You are placed in an active learning environment to enable development of group working and project process skills. These skills will be used to aid development of an identified web solution by a given deadline. You address the design and development of service oriented web applications. You implement the design with a range of solutions, including SOAP and REST. You consider a range of commercially available cloud based API’s and investigate data and application options available on a cloud based environment such as Azure and Amazon services. You carry out an in depth investigation of at least one commercially available IaaS, PaaS, or SaaS provision. Almost all software development is predicated with the use of software architectures, patterns and frameworks. You look at the overarching software architecture to develop complex software systems and the lower level architectural basis applying patterns and using proprietary frameworks. You gain conceptual knowledge and practical experience to build high quality, complex, extendable, scalable, maintainable and robust systems. You are taught by a combination of lectures and practical sessions in each module. Lectures concentrate on teaching the principles while practical sessions allow you to put these principles into practice. In your final year you undertake a major piece of work in the form of the Final-Year Project. This supervised project allows you to explore an area of interest in much greater depth and is an ideal opportunity to build knowledge and skills that will help you on your way to a career. Assessment across the modules includes a range of examinations, in-course assessments and teamwork. All assessments are designed to suit the requirements of the module and include case studies and technical exercises. Assessments are designed to build on the work you undertake in your modules and contribute to the development of knowledge and skills in a given subject area. If you’re applying for entry to Year 0 (Foundation Year) please use UCAS code G405 BSc/COMPFY. The flexibility of the course in allowing you to build your own pathway means that a wide range of careers is potentially available. The career path you take will be influenced by the choices made during your studies. By choosing appropriate modules and selecting your final-year project carefully, you could open career paths as disparate as web designer, programmer, systems analyst, games programmer, multimedia developer and network support. Jessica's time at Teesside led to a graduate role at Trade Interchange. Connor studied computing and now works as a Security Consultant for IBM. Dave changed courses and has found a job using skills he learned on both courses. 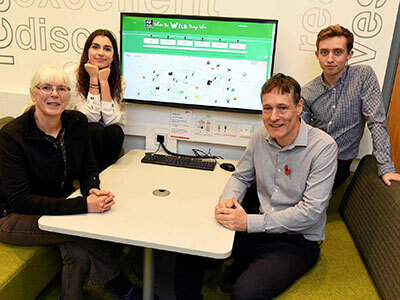 Talented Teesside computing students have created an innovative tool to help Tees Valley Wildlife Trust map and preserve childhood memories of local wildlife. Hear BSc Computing student Matthew Parvin talk about his course and how he not only learnt programming skills but also business relevant skills to help him communicate effectively with clients in the real world of business. He also talks about the app he developed for the ecology industry for his final year project and his placement year experience -- and how it helped him obtain his graduate job.